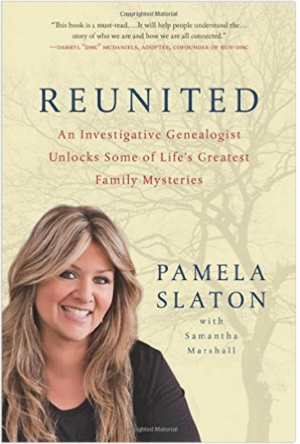 Investigative Genealogist Pam Slaton is well known to TV audiences for her success in reuniting adoptees with their birth families. Pam Slaton's passion is family—whether it's her own or someone else's. Pam is a wife and mother of two sons. Her profession is to reunite families whether searching for a birth mother or searching for a birth father or trying to locate a birth child or a sibling search, Pam is a nationally recognized Investigative Genealogist and Adoption Search and Reunion Specialist who's expertise is locating missing family, friends and loved ones. In 2006, Pam famously helped RunDMC's Darryl McDaniels in an Emmy-winning documentary "My Adoption Journey", in which McDaniel's conducted an on-camera search for his birth mother. "It's extremely rewarding to be able to make a phone call and tell someone that their search is over". Reconnecting lost loved ones isn't just work for Pam—it's personal. She started her business after the search for her own birth mother ended badly. "I loved my family, [but] I think there's a big misconception that people search because they're lacking something," she says. "I don't understand why people don't understand that basic need to know who gave you life." 2011 - Searching for ... on OWN - Oprah Winfrey Network; Starred in a 10-episode documentary series that aired as part of the 2011 launch season. Searching for… follows the real-life work of Pam Slaton, an investigative genealogist, stay-at-home mom and real New Jersey housewife. 2011 - ExtraTV with Mario Lopez - Lifechangers: Are You Searching For a Loved One? 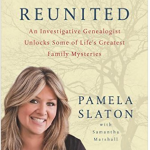 Reunited: An Investigative Genealogist Unlocks Some of Life's Greatest Family Mysteries Spring 2012 - by Pamela Slaton. The book takes readers on a fantastic journey that recounts Pam's remarkable adoption search, the lessons she learned and some of her most intense stories of searching for the lost. Where Did You Sleep Last Night? By best selling author Danzy Senna. Farrar, Strausand Giroux, 2009. Identical Strangers, by Paula Bernstein and Elyse Schein, Random House Trade Paperbacks, 2007. Pam provided expertise and facilitated an on-camera reunion for a woman who was searching for the birth daughter that she gave up for adoption 42 years earlier in New York. Pam investigates a young woman in her search for the birth mother whom she had never met. 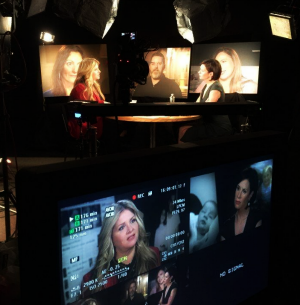 Expert investigation in assisting a young woman in her search for the birth mother whom she had never met. Emmy award-winning documentary that chronicled the story of Darry McDaniels, of the legendary hip-hop group Run-DMC, as he searched for his birth mother. The Story of twins separated at birth as part of a "natural lab experiment" conducted by their adoption agency. In Adoptee’s Search for Roots, Loss and Gain Collide, by Sarah Kershaw. New York Times, 2008. Truth's Painful Possibilities, by Ed Lowe, Newsday, 1999. Pam’s personal story of search and reunion. My Mothers, Myself by Colleen Van Tassel, 1998.